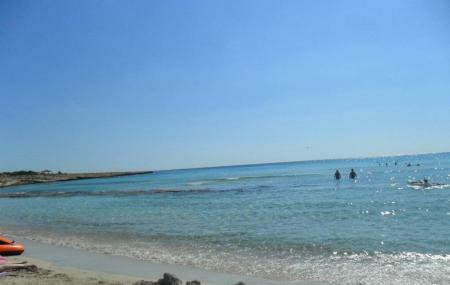 Landa beach is a beautiful beach in the city of Ayia Napa with mesmerizing scenery. The beach is sandy with shallow, clean water ideal for swimming. There are neatly arranged sun beds with beach umbrellas on the beach. Landa beach is an ideal spot to relax amidst the beauty of nature. The beach water is shallow and suitable for kids. How popular is Landa Beach? People normally club together Makronissos Beach and Nissi Beach while planning their visit to Landa Beach. People also prefer to end their day with Landa Beach. Beautiful beach, almost white sand, enough space to play games (e.g. with a ball). The bar nearby has very loud music on almost all of the time. The beach is good for kids and families. Nice clean beach good for snorkeling and water sports . Great one. Recommended to visit.